The non-slip cutter is equipped with a high-quality and non-slip rubberised surface and guarantees a precise, clean cut and a secure hold. The cutter is used both in the professional field, in the warehouse or workshop, as well as home improvement, wallpapering, etc. The extremely sharp snap-off blade with a thickness of 0.6 mm and a width of 18 mm is made of high-quality, coated, alloyed SK2 steel. The high-performance coating ensures a higher cutting speed. As a result of the longer service life, less blade change is required. The special faceted blade grinding guarantees an extremely sharp cut and allows the blade to guide safely through the material. In the robust metal rail guide with slide switch, the blade can be securely locked. Likewise, by locking the blade length can be adjusted individually depending on the material. 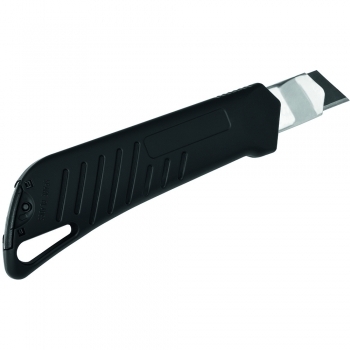 After use, the blade can be completely retracted into the housing. The used snap-off blade can be exchanged easily. The spare blade compartment contains two additional SK2 spare blades. Matching replacement blades are available in every hardware store.